Just Julie B's Stampin' Space: Hats Off Graduation Decor! Plus Blog Candy! 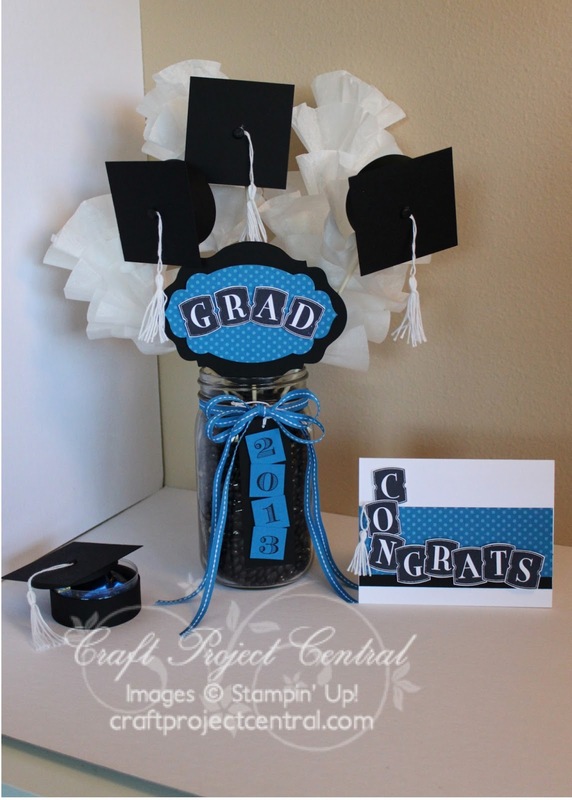 Make this graduation set for your upcoming graduation party! The individual graduation caps can be filled with treats for party favors! Then you can fill the centerpiece graduation caps with money for the grad’s gift. And, of course, a coordinating card ties it all together! This fun project was made by ME!! If you want the tutorial on how to make it all, you can go to Craft Project Central and subscribe to the month of May. You'll get this tutorial, plus nine others for just $10. **Or leave me a comment on this post by Monday, May 6th - and I'll draw a winner who will get a FREE subscription to Craft Project Central for the month of May!! I love the cap, so cute. My son graduates from NIU in 10 days, the caps would be cute on the tables. Can't wait to use this idea for the next graduation. I love the little graduation cap.